What do you do if you’re a homeowner with a metal roof, but you still love the look of DaVinci synthetic shake shingles? If you’re Harry Brinkerhoff, you have your installer use the shake roofing materials as siding for your home! “Harry wanted a distinct look to his home exterior so we suggested using Valoré Shake as siding to complement the rustic style of his house,” says Luke Duman, project manager/estimator of Guarantee Roofing & Sheet Metal in Sioux Falls, South Dakota. 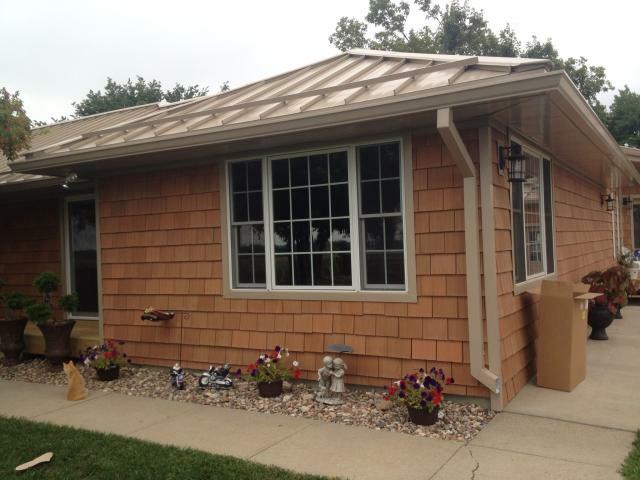 “He selected the New Cedar color blend which really looks like cedar shake siding. Because he has a lighter, tan-colored metal roof, the finished combination is extremely appealing. The metal roof with the synthetic shake siding looks fantastic.